St. Stephen, intended originally to be the National Order of Hungary, also owes its institution to the Empress Maria Theresa,and was designed as a reward for civil distinction and merit. It was founded on the 5th May, 1764, on the day when the presumptive heir to the throne, the Archduke Joseph (afterwards the Emperor Joseph II), was crowned King of Rome. The name was given in honour of the founder of the Hungarian kingdom, St. Stephen. 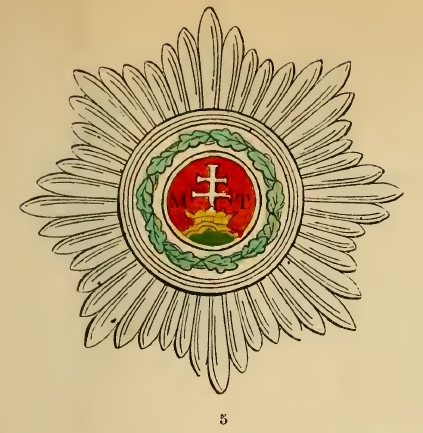 By the statutes, the Grand Mastership of the Order is vested in the Crown of Hungary, and the College is to consist of a hundred noble Knights distinguished by merit. They are divided into : Knights of the Grand Cross (to the number of twenty). Commanders (to the number of thirty), and Knights simple, (to the number of fifty). The badge (Nos. 6 and 7) is an octagonal cross, green-enamelled, with a golden edge, and containing another cross in the red-enamelled centre. On the obverse of the middle scutcheon is seen the Apostolic silver cross within a golden crown placed on a green mountain, bearing on both sides the initials of the founder : "M. T." (Maria Theresa), with the legend : "Publicum Meritorum Praemium" (Public reward of merit). The white-enamelled reverse of the scutcheon exhibits a cross of oak-leaf, with the legend : "Sto. St. Ri. Ap." (Sancto Stephano, Regi Apostolico). 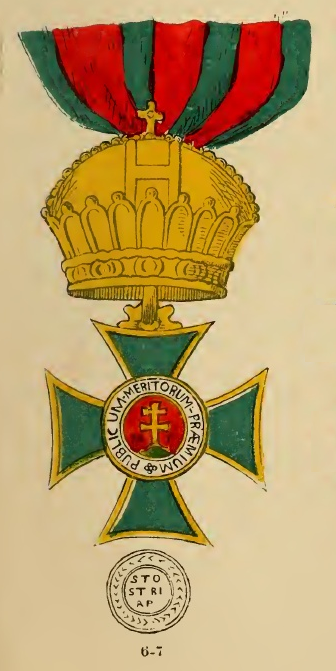 Above the cross is appended the Hungarian crown of gold. Green and red are the two national colours of Hungary, while the Apostolic cross indicates the renewed Apostolic title of the founder of the Order. The Order is suspended by a red ribbon with green borders, and is worn by the Knights of the Grand Cross-if laymen across the right shoulder, and, if ecclesiastics, round the neck. The Grand Cross Knights wear in addition, on the left side of the breast, a cross embroidered with silver, in the centre of which is seen the obverse of the badge, surrounded by a wreath of oak-leaves (No. 5.). The Commanders carry the decoration, suspended by a narrow ribbon, round the neck, without the star; while the Knights wear it, by a small and narrow ribbon, at the buttonhole. The Grand and Commander-crosses are to be presented only to persons of high and ancient nobility, or to high functionaries of the State ; while that of the Knights may be conferred upon the inferior nobility. The annual festival is celebrated on St. Stephen's Day (26th December), or on the following Sunday. The Costume of all the Knights, at public processions, consists of a long mantle of green velvet, bordered with ermine, and lined with crimson taffetas. The under-garment and the cap are of crimson velvet ; the latter is edged with ermine, and ornamented with heron-feathers, placed in a red and green enamelled sheath. The under-garment of the Knights of the Grand Cross is richly covered with embroidered oak leaves, while that of the Commanders, and simple Knights, has an embroidered border, the only distinction being in the size of the border, which, in the last, is somewhat smaller. ( No. 14.). The embroidery represents oak leaves closely joined to each other, being emblematic of honour for civil services. The Knights of the Grand Cross wear, in addition, on the festivals, or on any other solemn occasion, a golden collar, the links consisting alternately of the initials of St. Stephen and the founder of the Order, with the Hungarian crown between them. In the centre is the Golden Eagle, the bearing of the bouse of Austria, with the inscription : "Stringit Amore" (United by love). Only the Grand Cross Knights and the presumptive heirs to the throne, or other members, by special permission of the Grand Master, are free to adorn the insignia with precious stones. The most distinguished officers of the Order are, besides the Grand Master: 1st, the Prelate appointed by the Grand Master from the higher clergy, who performs Divine Service on their festival days; and 2nd, the Chancellor, who addresses the meeting when the Chapter is held, or when a new Knight is created, who reads the oath to be taken, sits at the side of the Grand Master on solemn occasions, reports the state of affairs, orders the issue of decrees, and is also the keeper of the Seal. The Chancellorship of the Order is always vested in the Court-Chancellor of Hungary. Every Knight of the Grand Cross becomes, on his election, a Privy-Counsellor of the State ; and every Commander a titular Privy-Counsellor. The simple Knights may, at their desire, be created Barons, and even Counts, according to circumstances. In decrees, the Grand Master styles the Knights of the Grand Cross, "Cousins". Every aspirant to the Grand Cross must prove his Seize Quartiers that is, his noble descent through, at least, four generations; but the Grand Master may make exceptions in favour of individuals of particular merit and distinction.
" gratiam et benevolentiam Nostram vobis confirmamus." (We doubt not, for a single moment, that you will steadfastly adhere, as becomes brave and honourable knights, to the vow of respect and loyalty made by your oath. In receiving, therefore, from our hands the insignia of the Order destined for you, keep the contents of your solemn oath inviolably in your memory, while, on our part, we assure you of our favour and benevolence).
" tus, nunquam ignorare possis." (Receive the insignia of the Order of St. Stephen as a public testimony of your [peculiar] merits, and wear them always about you, to remind you constantly of the distinguished honour bestowed upon you to-day by us, that you may never forget what you owe to God, to ourselves, to our house, and to the dignity of the Order). The Diploma is given to the Knights of the Grand Cross in the form of a book, and to the other Knights in the form of a patent.